This is my first Farmer-to-Farmer assignment in Bangladesh, and I have thoroughly enjoyed this experience, both professionally and personally. The Winrock staff and the people at Ejab Group (the host) were very professional, providing excellent logistical support and active participation. They made me feel “at home” all the time. 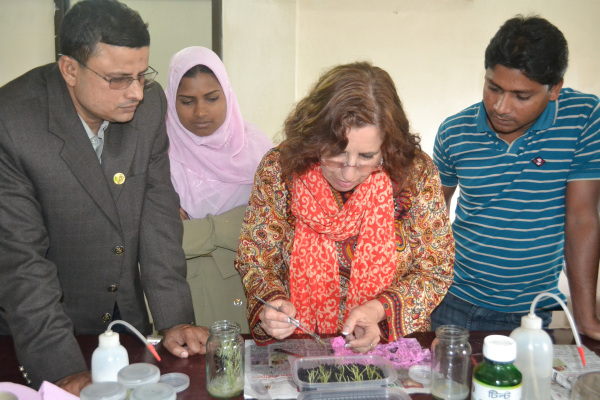 This was such a great opportunity for me and for the staff at Ejab Group’s lab to exchange knowledge about potato seeds! 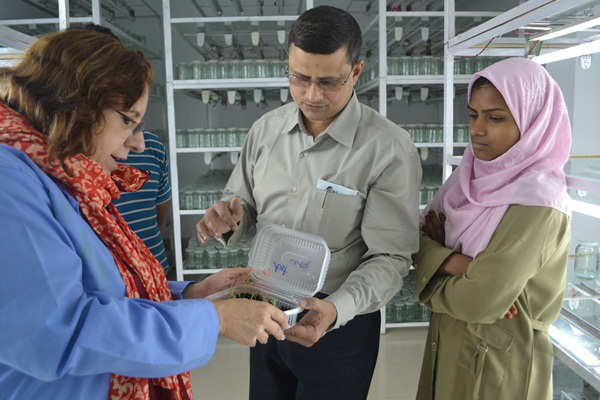 We discussed and worked on key topics related to the production of virus free, healthy potato seeds. We reviewed traditional tissue culture techniques as well as new low-cost alternatives that are being used in other countries. To increase productivity, high quality, healthy seed is essential. Thanks to Winrock and Ejab Group, my host, for giving me the opportunity to work together to improve the potato seed production in Bangladesh, for sharing their concerns and their enthusiasm, for hospitality and kindness, and for friendship. Here are some photos of Susana in action! It’s always rewarding to see and hear first-hand how our programs are making a difference around the world. Our team in Nigeria recently interviewed staff from one of our host (beneficiary) organizations. Their comments reiterate the value of the knowledge transfer and people-to-people exchange inherent to the Farmer-to-Farmer program. “There are not many opportunities of meeting experts in the course of our work in rural Nigeria. Through Farmer-to-Farmer, we have international experts working closely with our team. Such opportunities to rub minds with international volunteers are vital learning opportunities for us. It takes our pride as a learning organization to a truly international level. Invariably, the F2F assistance leads to opportunities of social interaction with my family and friends. Long time friendships have been started and sustained from these interactions. My children have the opportunity of meeting with people from different socio cultural backgrounds and this has made them truly global citizens.